A decent prog but it would seem I'm less delighted than others. I'm getting fed up with different writers seemingly having their own Dredd continuity. 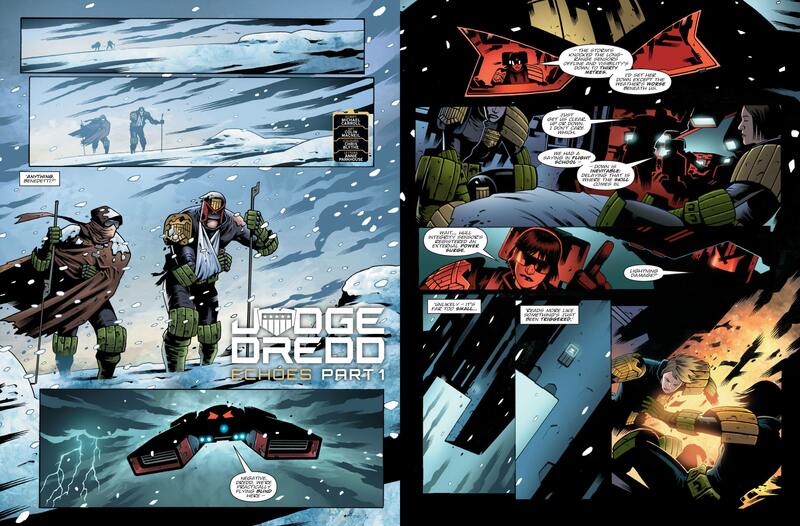 Eceladus is obviously a big deal in Williams' Dredd-verse but is never mentioned in any other writer's Dredd strips. Likewise, Dirty Frank and Sensitive Klegg seem to be Rob Williams exclusive characters (to be honest, I think both are joke characters who have worn thin). I know others are enjoying this, so fair enough, I just feel I have very little invested in Dredd these days. Brink is excellent. So atmospheric and tense. Fiends is pretty good. It's carried by the fantastic art. As usual with Edginton stories I like the ideas but feel the characterisation is lacking. Skip Tracer is just there. I really can't think of much to say about it. I still have no feel for any of the characters and the world building has been very sparse. Kingdom is great fun as always. Abnett and Elson make it look easy. This is probably why the Command Centre's server has went rogue: Thrill power overload! Definitely the best crop of thrills so far this year for me. What a difference a Dredd makes. I really enjoyed the Titan/Enceladus storyline but I felt it came to a logical end. The follow-ups haven't done so much for me but Williams is simply a better writer than any of the other current regulars and Flint colouring Flint is artistic Mega City Nirvana. Brink continues to be sublime. Abnett & Culbard have quietly created the most unlikely 2000AD hit. A talk-heavy cop strip set in a claustrophobic environment drawn by an artist whose primary characteristic is the amount of space he leaves in the panel. Skip Tracer is much improved but can't help but fall short in comparison. Many people think Kingdom is the best thing ever. I quite like it. You're far-right on the first point*, but only alt-right on the second. Which demonstrates what a versatile talent Chris Blythe is. This series has been all talking, all head. Not sure whether this is a necessary exposition dump efore the strip takes off in a new direction or if the creators have decided to wrap the strip up and are having to cram all the story they had worked out into the few episodes they have left. Still enjoying it, just wish they were doing the talking-fighting thing Pat Mills hates (but, amusingly, uses all the time). * Williams is evidently, demonstrably the best at putting all the words in the right order, although it would be interesting to see whether that changed if Tharg followed-up on the interest Abnett's expressed in having another crack at the main Dredd strip. For the record (as if anyone cares), I'd much prefer Abnett carry-on creating his own strips. The Small House isn't my bag, but this sort of gathering of dangling plot threads to weave a cosy continuity quilt is exactly what most of the board have been asking for whenever someone starts a WHY DON'T I LIKE 2000ad ANYMORE? thread, so I'm happy to enjoy it as a series of jokes with occasional splatter. ** Sir Isaac Neuter, Kanye Westie, The Impossible Lightness Of Bow-wowing ... I'm hoping the next species of Aux Abnett introduces are duck-based lifeforms - Duck-E Fresh, Duckie Howser MD, Nigel Plumage - the possibilities are as obvious as they are limitless. It looks like a continuation (or adaptation) of what I assumed was a bespoke mottled technique Blythe developed for Mick McMahon and Rory McConville's Lord Of The Fyreflies, from this time last year. Blythe coloured MacNeil's art on Carroll's Echoes in his usual, glossy style, just a few weeks later, and I can't remember him breaking out the SpongeBlob SquarePaints since. Devoured this prog and loved it. Not a bum note in it as far as I am concerned. I'm curious as to why I'm enjoying the DREDD so much. Titan was great, Enceladus and follow-ups less so. And secret departments within the justice department became it's own sub genre. But this all comes together for me in a nice exciting package with phenomenal art. But jeez, everybody involved in BRINK just knocks it out of the park every prog. Skip Tracer, Kingdom and Fiends all really, really good too. I enjoyed the previous run of progs, with The Order and Mechastophles etc, don't get me wrong. But this run feels as if Tharg has peeked inside my head (removed that fantasy about Kelly Brook and Famke Jansen propositioning me with a tub of Vego chocolate spread), and then put the results on the (digital) page. Getting seriously good proggage right now. Enjoying everything.